Homemade Bagels are fun to prepare and have the perfect mix of soft interior and crunchy exterior! 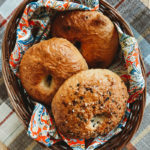 Making any bread from-scratch can be a labor of love, but let me tell you, these bagels are totally worth it! First, make the starter. In a medium bowl, using a wooden spoon, stir the flour with the yeast and 1 cup of lukewarm water until combined. Cover the mixture with a warm, damp cloth for 6 to 8 hours. This can be made the evening before and used the next day. This is what it looked like after about 6 hours. Next, make the dough. In the bowl of a stand mixer fitted with a dough hook, combine the starter you made above, 1 2/3 cups of warm water, yeast, and honey. Once combined, add the flour and salt and knead in your mixer about 5 to 7 minutes, until a dough forms. If the dough is too sticky, add a bit more flour. Too dry, add a bit more water. Transfer the dough to a lightly-floured work surface to knead into a ball. Transfer the ball of dough to a large, lightly oiled bowl. Cover with a warm, damn towel and allow it to stand in a warm spot for about an hour. Line a baking sheet with parchment paper or a silicone mat. Divide the dough into 12 pieces and form into tight balls; transfer to the baking sheet. Cover loosely with a warm, damp kitchen rag and let stand for 30 minutes. To form the bagels, poke your finger in the center of each ball to make a 1/2-inch hole. Return the bagels to the baking sheet, cover, and let stand until risen, about 1 hour. Add 1 bagel to a bowl of cold water. If it floats, the bagels have risen sufficiently. Preheat the oven to 475 degrees F and position racks in the lower and middle thirds. Line a baking sheet with a clean, lightly moistened kitchen towel. Bring a large pot of water to a boil. Add 2 t baking soda. Gently place two bagels at a time in the boiling water, simmer for 1 minute, flip, simmer for another minute, and place them on the kitchen towel to drain. Before the bagels dry, sprinkle them with your favorite toppings. Transfer the bagels to nonstick baking sheets and bake them for about 18 minutes, rotating the pan midway through. Let them cool slightly, and they are ready to serve! They can be stored in an airtight container for up to 3 days or frozen and defrosted to enjoy later.